Sunday July 10 1910 Vera and I went to church. The boys drove about town and we had the horse to go over home. We were all there for dinner. In the afternoon Otts folks and George & Flora came. Frank Stevens brought Vera out to our house before supper. Harry in the car and Will & I ahead of them in our buggy. After supper Mildred Stevens and brother with the children Eleanor Anderson and family and Mary & Tishie came. When they went down at 9.12 Vera and I went down to the city with them and coming right bck on the car with Otts family who were starting for the north. 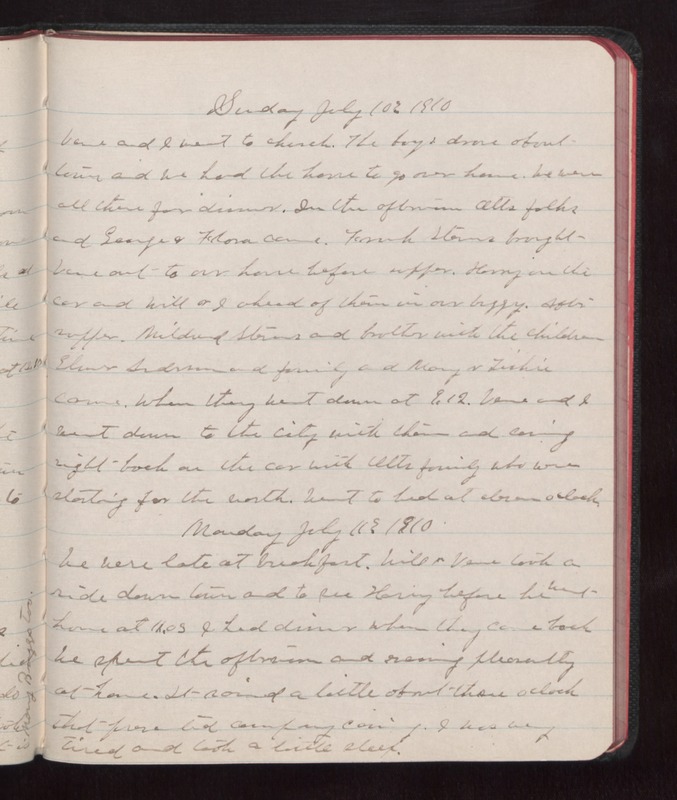 Went to bed at eleven oclock Monday July 11 1910 We were late at breakfast. Will & Vera took a ride down town and to see Harry before he went home at 11.05 I had dinner when they came back We spent the afternoon and evening pleasantly at home. It rained a little about three oclock that [illegible] [illegible] company coming. I was very tired and took a little sleep.